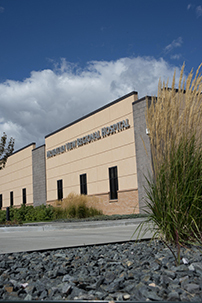 Mountain View Regional Hospital (MVRH) in Casper pledged $45,000 in support for the Marcia Dale Aspire Scholars Program at the University of Wyoming Fay W. Whitney School of Nursing (FWWSON). The hospital announced its decision this summer to provide $15,000 annually for the Aspire senior class per each of the next three years. The MVRH gift will materialize in scholarships for each of the senior Aspire Scholars as well as provision for travel costs associated with mentoring opportunities with members of the MVRH staff. Only four students are chosen each year for the nursing Aspire program, which begins in the second semester of the students’ freshman year and continues throughout the four years of the undergraduate program. The main purpose of the program is to allow students to experience professional growth and to develop leadership, communication and collaboration skills. Students serve as ambassadors for the FWWSON and participate in a variety of activities, such as Legislative Days and Discovery Days. Acceptance into the Aspire program follows an intense application and interview process and culminates with the guarantee of admission to the competitive nursing major component, normally in the students’ junior year of college. See the current Aspire Scholars' reactions to Mountain Valley Regional Hospital's gift below. Mountain View Regional Hospital has a great reputation--the hospital of choice for many people in Wyoming. I think it is an honor and a privilege to be mentored by their leaders. There are many different ways of doing things in health care. I think it will be interesting to see how they do things, such as their policies and procedures as well as what nursing characteristics they emphasize. I am continually amazed at the multitude of opportunities provided by Aspire. I feel as though ideas are always brewing in the bright minds of the Aspire staff and scholars. This gift will enable Aspire members to make their ideas a reality and will provide more learning opportunities, such as attending conferences and seminars that may have not been possible without the kindness and support of Mountain View Regional Hospital. It means so much to me that MVRH recognizes the potential of the Aspire program and its students and is giving us so much support. The financial aspect is wonderful, and I appreciate it so much; but the gift of the time that the leaders at MVRH are willing to invest in us as our mentors will have such a profound impact on our professional development. This gift means so much to me and to the Aspire organization. It will allow not only me, but all of the other members to grow as nurses and leaders. To be able to be mentored by the leaders of the Mountain View Regional Hospital is invaluable! The scholarship will also help us focus more of our time on our studies. Although I have not had the opportunity to visit MVRH yet, I am very excited to do so in the future and to learn more about their hospital. Although I grew up in Sheridan, I was actually born at Mountain View Regional Hospital and lived in Casper for many years. Mountain View Regional Hospital has cared for many of my family members and will always have a special place in my heart. I would be honored and privileged to be mentored by the nurses and other health care providers that work there. They have positively influenced my family’s lives and now are making an even greater impact on mine. No words can describe the thanks and appreciation that this hospital and its staff deserve. When I heard about the generous pledge from Mountain View Regional Hospital, I was very excited. While I have never been to MVRH, I have heard nothing but good things about it from older students. The fact that the MVRH staff is willing to take time out of their busy schedules to mentor us and help us grow professionally is an absolute blessing to all of us in the Aspire Program. This will greatly help Aspire to grow in the amount of opportunities that are available to its students and help us on our way to becoming nurses. I honestly was floored when I first heard the news about the MVRH gift towards the Aspire program. It always amazes me how supportive the community is of students, and Mountain View Regional Hospital is a great example of this support. I am so grateful for their interest in our education, and I am excited to see what is in store in regard to mentoring opportunities at the hospital. I know that this will greatly enrich my experience as a nursing student and Aspire scholar and will carry over to my nursing career. I was amazed when I first heard the news that MVRH decided to donate to the Aspire program. I love that they are willing to give us so much support for the program. The scholarship will help me to further my learning in the nursing school, but more importantly, the staff mentoring by MVRH will help me to learn skills and experiences in a clinical setting that will last a lifetime. MVRH’s gift will allow the Aspire program to grow and develop by enabling the scholars to participate in more leadership activities, gaining new experiences that will be beneficial to us both now and in the future. I feel really blessed that an organization would want to invest that much time and money into some future nurses' lives. I am truly honored to be able to have this opportunity to be mentored by the MVRH staff. In fact, the opportunities to be mentored in the Aspire program were one of the reasons I even considered applying to be in Aspire in the first place. Mentoring through MVRH will give me firsthand experience about what it means to be a leader in a hospital setting. Their encouragement and advice will definitely help during and after nursing school. I am overwhelmed by Mountain View Regional’s gift and grateful to them, not just for their financial support for Aspire, but for wanting to take the time to mentor us as well. I feel so lucky and blessed to be in the Aspire program so that I can take advantage of this wonderful opportunity to be nurtured by the staff at MVRH. I think it is just incredible that they are willing to invest in our lives to help us be successful. I was ecstatic when I heard about this gift! I feel so blessed to be a part of the Aspire group and all the amazing opportunities it offers. Personally, the scholarship money means so much. As everyone knows, college is so expensive and every penny counts. The mentoring with MVRH will help me grow as a person as well as give me more leadership skills as a nurse. As for the Aspire Program, the gift will help Aspire continue to grow and blossom into an even bigger, better program than it already is. We can never have enough leaders in our field of work. Thank you MVRH. Your gift will change our lives by opening so many new doors.